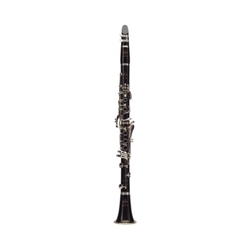 Developed in 1955 by Robert Carre, the Buffet R13 Bb Clarinets are the world's most popular and fit well with all types of musician. The R13 is a clarinet with unparalleled flexibility and a lively, responsive sound that cannot be found anywhere else. The bore features a polycylindrical design that creates better focus and adds more "ring" to the tone. Each R13 is complete with leather covered, wood case and necessary care accessories. The Buffet Crampon R13 is made of stained grenadilla wood, has a hand burnished bore, and power forged keywork and posts that are pre-plated in copper. The clarinet also features an adjustable thumb rest, undercut tone holes, polycarbonate fiber reinforced tenons, and Gore-Tex pads. The result is simply the finest professional clarinet on the market, and is considered the reference standard by which all other clarinets must match. Throughout its long lifetime Buffet Crampon has developed the most complete range of clarinets, while always taking musicians', conductors' and composers' requirements into consideration. Developed in 1955 under the guidance of Robert Carre, the now legendary R13 clarinet quickly became the choice of professional musicians. Musicians are charmed by its rich and focused sound, its power in all registers, and its flexibility. The R13 is suitable for all types of musician, symphony or chamber music, soloists, teachers, those in marching bands, students, and amateurs.